Three important international initiatives each seek to create enabling environments for better decision-making, by mainstreaming considerations of natural capital. The Forum on Natural Capital Accounting (NCA) for Better Policy, the Government Dialogue on Natural Capital, and the Combining Forces Initiative have joined up to hold a combined meeting on 26 to 27 November 2018 in Paris during what has been called Natural Capital Week 2018 (Paris, France). The Forum on Natural Capital Accounting (NCA) for Better Policy Decisions is a yearly forum providing countries, international agencies and interested stakeholders a space to discuss the use of the natural capital accounting to support policies. The 2017 Forum highlighted the need for building collaboration with the private sector, which is making rapid progress in natural capital accounting and complementary approaches. The Regional Training Workshop of SEEA -EEA for Latin American and Caribbean will be jointly organized by the Brazilian Institute of Geography and Statistics (IBGE), United Nations Statistics Division (UNSD) and United Nations Environment, in close collaboration with the United Nations Economic Commission for Latin America and the Caribbean (UN ECLAC). The workshop will be held in Rio do Janeiro from 21 to 23 November 2018. The workshop is organized as one of the activities of the project ¨Natural Capital Accounting and Valuation of Ecosystem Services¨. This 3-year project, implemented by UNSD, UN Environment and the Secretariat of the Convention on Biological Diversity, with funding of the European Union, has been launched as a partnership with Brazil, China, India, Mexico and South Africa. Building on internationally agreed methodology (the SEEA Experimental Ecosystem Accounting), partner countries will inittiate pilot testing to advance the knowledge agenda on natural capital accounting. Big Data, administrative data and traditional statistical data sources should be treated together via a multi-source approach; the challenge is not to overcome problems of using Big Data in itself, but to achieve trusted data collaboration; and in that respect the UN Global Working Group on Big Data needs a collaborative Global Platform for the overall organization of its work. 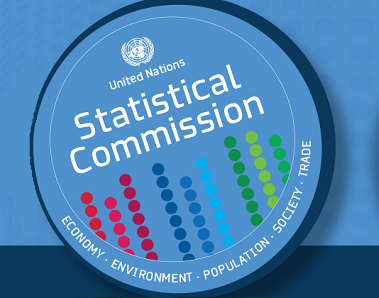 Data collaboratives are a new challenge and new opportunity for the community of official statistics - in relation to Big Data, to the SDGs, to the sharing of data, services, technologies, and know how. The event is organized in collaboration of the UN Global Working Group, DANE and the Colombian Ministry for ICT. During the 3-day training participants will also discuss and share their experiences on the implementation of the SEEA EEA. The training may explore further technical issues related to the SEEA EEA, including the ecosystem-related indicators for Sustainable Development Goals and the SEEA Agriculture, Fishery and Forestry. The United Nations Statistics Division, United Nations Environment Programme, and the Secretariat of the Convention on Biological Diversity have launched the project "Natural Capital Accounting and Valuation of Ecosystem Services" in China. The project, funded by the European Union, aims to mainstream natural capital accounting and valuation of ecosystem services in data driven decision and policy making. The objectives of the inception mission is to undertake consultations together with the National Bureau of Statistics (NBS) of China with various line ministries and stakeholders for the development of a work programme for the implementation of the System of Environmental-Economic Accounting Experimental Ecosystem Accounting (SEEA EEA) in China. A stakeholder consultation meeting, hosted by the NBS, will take place from 1 to 2 November 2017 in Beijing, China, to 1) officially launch the project in China; 2) to identify how the SEEA EEA could support sustainable development policy initiatives in China; 3) to discuss and elaborate the statistical programme of Natural Capital Accounting in China, and 4) to discuss and agree on the project management arrangements and the work programme for the implementation of the project.